Successfully Added T95m Android TV Box - Android 5.1, Kodi 16.0, 4Kx2K, Wi-Fi, Amlogic S905 CPU, Optical SPDIF, OTG, Miracast, Airplay, DLNA to your Shopping Cart. The T95m 4K Android TV box with its Amlogic S905 CPU and 1GB of RAM is plenty of power for streaming video and running all your media and even supports 4Kx2 video decoding as well as 4K outputs. The Androids 5.1 OS brings easy navigation with its friendly interface while ensuring a smooth performance as it handles all you media, gaming and productivity needs making this min TV box the perfect home computer. A real highlight of this box is that it comes preinstalled with the Kodi Media player. Providing access to a ton of HD movies, TV dramas and the latest entertainment you'll be hard pressed to find more free content all in one place and with it being streamed directly to your TV you don't need to worry about storage space. For even more content you can go use the Google Play store for access to Hulu, Netflix and the wide wealth of other apps providing you with an almost limitless choice for your entertainment needs. On the front of the TV Box is a cool mini LCD screen to keep you informed of its status, connectivity and the time and it comes with a comprehensive remote putting you firmly in the driving seat. When it comes to connectivity the T95m has you coved with Wi-Fi making it easy to connect to your home network and reducing the need for cables while freeing up where you can position this mini media player. There are 2 full size USB ports, for all the peripherals you need, a USB OTG port for adding in memory pens and the like, as well as a micro SD slot that can support up to 32GB of extra storage. With optical SPDIF you can easily hook up this TV box to you home speakers with lossless audio, great for parties and that home cinema experience. 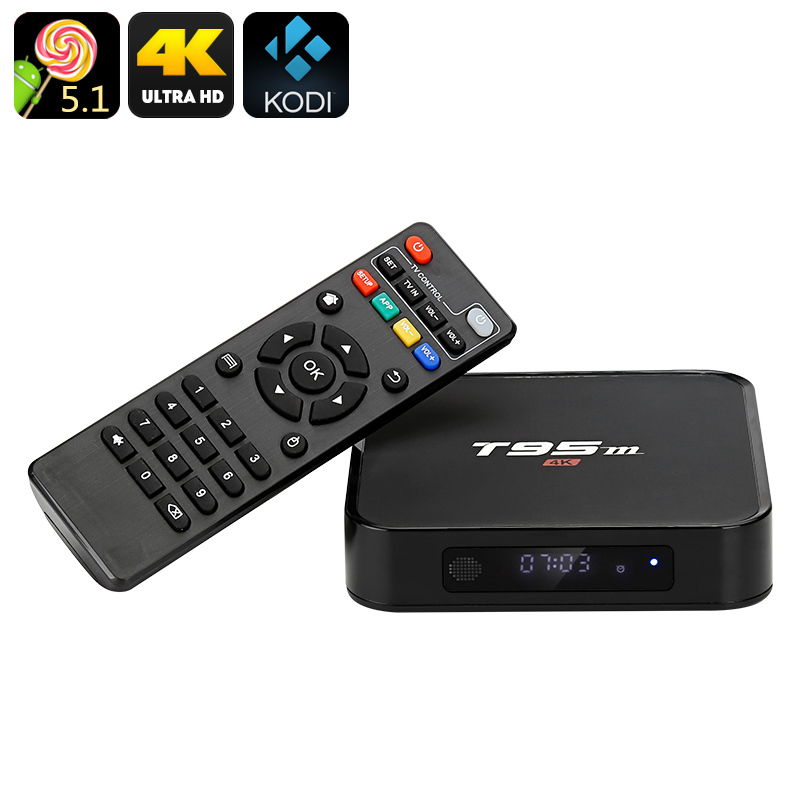 The T95m Android TV Box comes with a 12 months warranty, brought to you by the leader in electronic devices as well as wholesale Android TV Boxes..